Arthur A. Levine Books, 9780545478533, 40pp. Selina Alko's art brims with optimism, experimentation, and a deep commitment to multiculturalism and human rights. 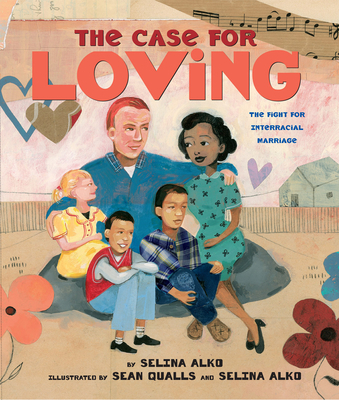 She is the author of The Case for Loving, which she illustrated with husband Sean Qualls, and the co-illustrator, also with Sean, of Two Friends by Dean Robbins. She has written and illustrated other acclaimed picture books, including Daddy Christmas & Hanukkah Mama and B Is for Brooklyn. She lives in Brooklyn, NY, with Sean Qualls and their two children. Learn more at selinaalko.com. Sean Qualls weaves the world into his pictures and finds inspiration everywhere, from old buildings, nature, fairy tales, black memorabilia, and outsider art to cave paintings, African imagery, mythology, music, and his native Brooklyn. His rich oeuvre includes an array of subject matter connected by his playful use of color and composition, and fueled by his sense of curiosity, empathy, and social justice. He has illustrated many celebrated books for children, including Two Friends by Dean Robbins and The Case for Loving by his wife, Selina Alko, with whom he illustrated both books; Giant Steps to Change the World by Spike Lee and Tonya Lewis Lee, Little Cloud and Lady Wind by Toni Morrison and her son Slade, Dizzy by Jonah Winter, and Before John Was a Jazz Giant by Carole Boston Weatherford, for which Sean received a Coretta Scott King Illustrator Honor. He lives in Brooklyn, New York, with Selina Alko and their two children. Visit him online at www.seanqualls.com.